According to research firm Smart Insights, the mobile point of sale (mPOS) market is expected to grow to 52M units deployed by 2018, representing a CAGR of 40 percent for the period 2013-2018. Much of this growth will be driven by mPOS adoption in emerging markets. The Smart Insights study predicts that by 2018, there will be 25 million mPOS units in the Asia Pacific region alone. Here, we’ll explore what’s driving mPOS adoption in these markets, and what benefits mPOS provides over cash only or payment terminals. To get a clear picture of what’s driving mPOS in emerging markets, it’s important to first consider what constitutes an emerging market in terms of payments. One common way to look at it is through the lens of market penetration for traditional terminals. The measure for this is the number of terminals per thousand inhabitants, which in the U.S. and most European countries is currently in the range of 25 to 30. By this measure, any country that has 10 or fewer terminals per thousand inhabitants can be considered an emerging market country in terms of payments. In China and Mexico, the number hovers around seven, and in Russia, about eight. Often, rates are low because the volume of card payments doesn’t justify investment in payment terminals. One reason may be that some cultures have traditionally relied more heavily on cash transactions. In emerging markets, consumer needs are being met in innovative ways that depart from what is typical in North America and Western Europe. One phenomenon we are currently seeing in emerging markets is a leapfrog to mobile payments. Much in the same way emerging market consumers have eschewed landlines and wired networking infrastructure for mobile connections, we are seeing emerging market merchants go straight from cash boxes to mobile POS (mPOS) solutions. This trend can be seen in statistics compiled in the annual “Internet Trends” report from Kleiner Perkins Caufield & Byers, such as the fact that in Asia, mobile makes up 37 percent of Web use, as opposed to just 16 percent in Europe, and 19 percent in North America. Hence smaller merchants with lower transaction volumes are more inclined to leverage a mPOS solution where they’re able to pay-as-they-go rather than sign up for fixed monthly/year contracts and fees. Most of these smaller merchants in emerging markets also already own a mobile device and are comfortable using this intuitive technology, thus reducing the learning curve and upfront investment needed to accommodate credit card payments. The chief benefit of mPOS, of course, is gaining the ability to accept secure card and electronic payments on the go. 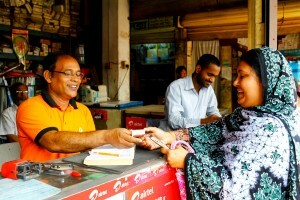 In places like India, Vietnam and Indonesia, it is common to see door-to-door sales forces for services such as insurance sales,prepaid utility services, and bill payment services. These sales forces are inherently mobile, so mPOS fits the need to take payments on the go, while devices such as smartphones and tablets give salespeople a form factor to be able to do things like review contracts or billing records online. With mPOS, these mobile sales forces have a secure, mobile way of taking payments, plus the tools to provide customers with a more personalized experience. Another strong merchant category in Asia Pacific is the small, curbside retail shop. In India, these are known as paan shops, which started out selling tobacco products, but now function much like mini retail outlets. These small merchants need a way to securely process credit cards transactions to grow their business beyond cash but adapted to their smaller transaction volume and network services. Shop owners typically already have mobile devices, so mPOS is a perfect fit for them. In emerging markets, consumer needs are being met in innovative ways that depart from what is typical in North America and Western Europe. Many people in emerging markets lack traditional bank accounts, but there are thriving services for money transfer, prepaid credit cards, and other financial tools that mPOS facilitates by providing a secure mobile payments platform. Governments typically are looking to encourage innovative services that support broader access to banking, insurance, and use of credit cards. This is known as “financial inclusion” in theory, but in practice, it needs tools like mPOS to help make it work. Stronger security. Because emerging market countries already typically use EMV cards (either chip and PIN or chip and sign), mPOS payments within these countries are highly secure. Transactions are encrypted end-to-end, and the terminal/reader itself is an EMV-approved unit that can’t be opened without erasing its data. No card data is ever stored on the reader, dramatically reducing the risk of data breaches. And of course, mPOS eliminates the need for merchants to handle or carry large sums of cash, thus reducing the risk of theft. Improved efficiency and record keeping. Besides readers and core payments functionality, mPOS solutions often feature apps that merchants can use to support other business processes. For example, the overall mPOS solution might include apps for building quotes or creating contracts, and links to product information or customer records. The data collected and stored helps create a better customer experience and also streamlines bookkeeping. Helps merchants accommodate growing transaction volumes. 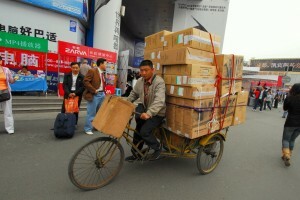 While many emerging markets merchants operate at low transaction volume, the hope, of course, is that they will grow. The more advanced mPOS solutions can accommodate a wide range of merchant sizes and can scale to meet a merchant’s growing business needs. In emerging markets, mPOS fits distinct needs. Economies feature many small shops looking to accept credit card payments to grow their businesses, sales forces tend to be mobile already, and consumers and merchants alike are already comfortable in the mobile realm. mPOS can act as a lubricant and economic accelerator in these economies and will play a key role in the development of these emerging markets. Youtap payment solutions support the world’s most popular POS devices alongside our own acceptance devices. From tier 1 to tier 3 empower your merchants with the right hardware to accept cashless payments wherever they may be. Learn more about our acceptance devices on our Devices page or if you have any questions get in touch today!